Classic Portrait Source by Sayles is proud to have created hundreds of fine portraits for families in the Mid West part of the country. We specialize in giving our clients a unique portrait that reflects the person’s essence on a piece of canvas. We offer a unique service for our clients by getting them involved with the artist from start to finish. Our goal is to preserve the fleeting moments of childhood with a museum quality heirloom portrait. 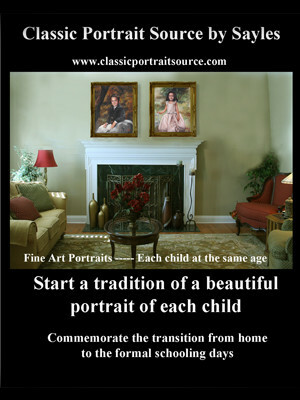 Many of our clients have established a time honored tradition of doing a portrait of each child at the same age. This sends a message to the child that they are very important. Some families will choose to do a painting of all of their children together. Thankfully for those with young children, gone are the days of sitting still for long modeling sessions with an artist. Our success is in the ability to capture the wonderful expression and pose of each child in the well controlled elements of the studio. There are key times in a person’s life that they will have their portrait done. This could be as an individual, a couple, or a family. We will work with the client to design that special portrait that will stand the test of time. 5. selecting the appropriate frame for the finished piece of art.